The Kentucky Derby is always the most difficult race of the year to handicap. What other race features of field of twenty (!!!) horses racing a distance longer than they have ever seen before, many of them not even having reached full maturity? The combination of these factors is what makes this race a lot of fun, and also makes the first Saturday in May a special time of year. As hard as it always is to handicap this race, it is even harder to formulate a betting strategy, and would you believe me if I told you that this may be the toughest Derby to figure out since I began picking them back in 1993? The fact is, as I mentioned above, many of these horses have not reached their full potential and will improve as the autumn nears, but as of now, on paper, this has to be viewed as one of the weakest crops of three year olds in a long, long time. One might think this makes the job of figuring out this difficult race a bit easier, but on the contrary, with such a suspect bunch, all of them with their fair share of flaws, it makes the job of narrowing down the candidates almost impossible as their attributes all seem to blend together. Perhaps that is a good thing, as bettors will be forced to look more closely at each horse, and won’t have the luxury of quickly dismissing a Giacomo or a Mine That Bird that could come back to ruin all of their tickets. My two early picks, Premier Pegasus and Jaycito, both found themselves off the Derby Trail with injuries, and the three horses that I like best in this field all drew perhaps the worst post positions possible, only adding to the chaos, and one of those three is still not even a certainty to start, and has to drop based on that (more below). If you can read between the lines, I don’t think any of these horses are very good. In the end, it feels like this year I might have better luck simply throwing darts at a board, but it’s May, so I will give it my best shot using my normal parameters. With a lot of high priced horses with big chances, payoffs could be worth the trouble of digging a little deeper. Oh, and in case there weren’t enough random variables already, this just in- it’s been a pretty wet spring in Louisville. It used to be that a horse needed to run a 100 Beyer in a spring prep race to even merit consideration for a strong showing in the Derby, but the aforementioned upsetters bucked that trend in the last half of the last decade. This year, astoundingly, only two of the twenty starters have ever posted a Beyer figure over 100 in their entire career at any distance. One is Uncle Mo, who ran a 108 in winning over this very track last fall at the shorter distance of 8.5f, still around two turns. He has been unable to duplicate that figure in his two starts this season and has lingering health questions. The other is Soldat, who posted a 103 in a 9f allowance race at Gulfsteam in January, but has since regressed from that figure in consecutive races. Bottom line? Speed figures don’t mean much this year–if they ever meant anything to begin with. Pros: This impressive winner of the Louisiana Derby held off two rivals down the stretch in that race after running near the pace, made a vast improvement figure-wise and was later flattered by runner-up Nehro’s strong second place finish in the Arkansas Derby. It was later revealed that he won that race just after recovering from a lung infection and ringworm on his legs that limited his workout regimen, so what he is capable of at full strength and fitness remains to be seen. His sire is an A.P. Indy Colt and he boasts strong distance influences from his dam side, inbred to Seattle Slew, Secretariat, Mr. Prospector and Buckpasser. He figures to move up on an off track, as he broke his maiden winning by 7.5 lengths over the slop, while his pedigree suggests an affinity for the off-going as well. His seven races around two turns gives him an advantage from the standpoint of experience. Coming out of the #7 Post with a lot of speed inside of him, he figures to be in position to run his race. Cons: He hasn’t raced since the aforementioned victory in the Louisiana Derby, and that was six long weeks ago, so there are valid questions regarding his fitness, although he has stepped up his game as far as workouts are concerned, getting four strong ones in over that time period. His sixth place finish in the Risen Star (while still nowhere near 100% health) was rectified in that race, but his consistency seems worthy of consideration. Earlier this year, he set the pace in the 8f Lecomte before fading down the stretch, so the 10f distance may not be ideal for him. Conclusion: I’m willing to throw out his Risen Star due to his health issues, and recognize that he did have a wide trip and still made an impressive move from just off the pace. He demonstrated his ability to rate off the pace and hung on gamely to fend off two tough foes in the Louisiana Derby, and if he can avoid a pace duel and put in similar effort, he could be live at a pretty big price. His closing fractions in his last race of :12.7 for the final eighth and :37.8 for the final three eighths don’t tower above his competition, but they put him in the mix if he can take a step forward. As much as I generally avoid playing pace horses, if I am going to use one to balance my tickets, it will likely be him because I think he can sit just behind the main speed and still be there at the end, especially if the track comes up wet. 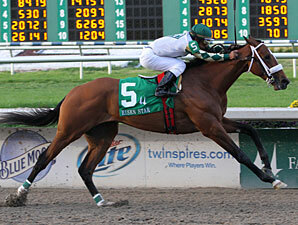 If you like Nehro or Mucho Macho Man, which I do, then you have to like him as well. He’ll be my value play for my exacta box, and may even end up on the top line of my trifecta, because in this race, you’ve got to be in it to win it. Pros: Perhaps the most experienced runner in the field, Soldat has three 9f races under his belt and wins in two of those. In his first race of the season, an allowance race at Gulfstream, he posted the field’s only 100+Beyer at that distance, running on the lead and demolishing the over-matched field. 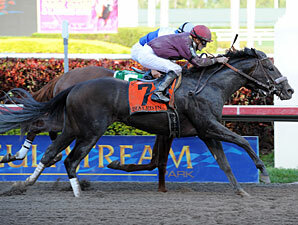 He came back from that race to win the prestigious Fountain of Youth before coming up flat in the Florida Derby. Last year, he had some success over tracks labeled “sloppy”, and also ran a game second at Churchill over the grass in last year’s Breeders’ Cup Juvenile Turf, so he could be another one to keep an eye on if the track comes up wet. He seems to be training well, having worked 5f in :59 last week at Palm Meadows. Cons: This need-the-lead type didn’t fire at all in the Florida Derby after falling off the pace getting dirt kicked in his face and finished an unimpressive fifth against stronger company, coming home the final eighth in a disastrous :14.7. He’s now seen two consecutive descending Beyer numbers after posting a field high 103 back in January- his 96 in the Fountain of Youth and 89 in the Florida Derby don’t demonstrate the type of pattern you’d like to see coming into such a big race and instead seem to indicate a horse that is regressing. It could be that he has a real preference for the off-going, and a fast track could be detrimental if he is unable to get an easy lead, which he almost certainly will struggle to attain here in such a large field with more speed than he is used to seeing. (His fractions of :47.4 and :48.1 while setting the pace in his earlier 9f victories will be a good ten lengths off the pace here). Conclusion: If you’re willing to throw out his Florida Derby, which is a big if, then he certainly stands a better chance than most from a speed perspective and could enjoy a decent trip if he can break well from his far outside post. His Thoro-Graph pairing from his previous two races are the best here, so if you are drawing a line through the Florida Derby and think he can hang on for an extra furlong, he is definitely usable. Track condition could be the deciding factor as to whether he should be used, but there are others here that I like better. I just feel that he is a bit one-dimensional and won’t appreciate the distance, wet track or not. He is certainly all of a sudden the “wise guy horse”, which is usually the kiss of death. Pros: This big, strapping colt set the pace in the Florida Derby (:46.1 opening half) and nearly held off likely favorite Dialed In, finishing second after fading down the stretch. Interestingly, he beat Soldat fairly handily in that race, turning the tables after finishing well behind him in the Fountain of Youth. He broke his maiden at Churchill, and is one of the few colts in this race with a victory over the track. He’s perhaps the most impressive physical specimen in the field, and it is likely that he has not realized his full potential as of yet, and depending on your opinion of Soldat’s Florida Derby, he may have taken a giant step forward in that race. He’s raced three times at 9f so he has experience at longer distances. He blazed 5f in :58.4 in his final work last Saturday, and would be another one to watch on a sloppy track based on his 418 Tomlinson Wet Figure. Cons: Still, the extra distance here is a big concern, as he figures to be near the lead from the start, and considering he wasn’t able to hang on after setting a hot pace in the Florida Derby at a shorter distance (final eighth in :13.7, final three eights in :39.5), one has to wonder how much he could benefit from an extra furlong while needing to run much faster early on. While his female side provides some distance influences, his sire line indicates more speed than stamina, and his dosage number is among the highest here at 3.62. Conclusion: With the speed of the speed (The Factor) declared out of this race, Shackleford figures to have an easier time setting the pace and could get away with easier fractions than some might anticipate. That appears to be his only chance. Even so, I’m inclined to like the above two just a touch better in a potential “wire to wire” scenario, as I think Shackleford figures to go right to the lead and take the field through the first half in about :46 flat. Some will argue that he gave the likely favorite a run for his money in the Florida Derby, losing by only a half length in the final strides, but you have to make a decision about that race: you either think it was an aberration that was too bad to be true and all of the horses ran poorly because of the heat, or you believe that they are a cut below the rest of the field. I side with the latter argument. Pros: This is another seasoned colt who has demonstrated grittiness running on the lead. He has raced thirteen times at nine different distances, winning six of those, so he has shown some versatility. He was an impressive runner up in the Santa Anita Derby, being caught at the wire in the final strides, and posted a competitive figure in that race, albeit on a notoriously speed favoring track. Cons: He demonstrated similar weakness with holding on at the end of races in his fourth place finishes in the San Felipe and El Camino Real. He led throughout both of those races, but when it came time to fight off his rivals down the stretch, there was no gas left in the tank. That doesn’t bode well for tackling the extra furlong, and nothing about his pedigree screams distance. Conclusion: He’s a hard trier, but a likely pace casualty, as he won’t get away with the relatively easy splits he set in the Santa Anita Derby if he wants the lead here. His post sets him up well to battle for the early lead with Shackleford, but as far as the end of the race is concerned, there isn’t any handicapping angle I can find that makes me want to use him. Pass. Pros: He has been fairly consistent, finishing second in two of his last three races. He is prone to go towards the front, and should battle for the lead here, and could move up heading to the dirt surface off his last race over the polytrack in the Blue Grass. He fired a bullet :47.2 four furlong work a few weeks back in preparation. Cons: It doesn’t appear that he has the ability to extend his speed to compete with the rest of the field. He hasn’t posted a Beyer over 90 past 9f, which in any other year would make him an automatic toss. There’s always room for improvement, but what is more concerning is his pedigree, which doesn’t suggest this horse wants any part of 10f. His Tomlinson Distance figure of 242 is the second lowest in the field. He was easily beaten in the 8.5f Risen Star, finishing fifth behind two of these runners, and losing ground down the stretch. This race is much longer. Conclusion: He’ll have to go to the lead early coming out inside of the other speed horses, so his likelihood of getting burned up in a speed duel increases. One of my few absolute tosses, as the combination of his running style and lack of stamina is one of the last things you hope to see in a Derby horse. Pros: The defending two year old champion and impressive winner of the BC Juvenile at Churchill posted a 108 Beyer over two turns in that race last November over this very track, which is tops here. Very simply, if he runs back to that effort and can handle the distance, he wins easily over this somewhat suspect field. He appears to have had excuses in his shocking Wood Memorial defeat with a gasto-intestinal infection, and still came home competitively with a final eighth in :12.8 and a final three eighths in :37.8. He’s been forced to work over the slop in Louisville, but seamed to be going well, covering 4f in 1:01.3 and galloping out 7f in 1:28.1. While Indian Charlie colts have struggled with distance, his damsire Arch was a winner of the 10f Super Derby and has produced some strong distance runners like last year’s Breeders’ Cup Classic champion Blame, while Indian Charlie’s sire In Excess holds the track record for 10f for his win in the Suburban. If you can toss his last race due to health issues, after digging a bit deeper into his pedigree, he may enjoy the distance more than a lot of people think. Also interesting to note is that his Tomlinson Wet Figure of 421 is the second highest in the field, so and his running style also lends itself to a sloppy track. Cons: It is unknown how much his infection affected his performance in the Wood, but he certainly didn’t help to clear up the already widespread worry that he wants no part of the distance. And having an infection four weeks ago isn’t a great excuse if you can’t prove that it has cleared itself up. As mentioned already, his sire Indian Charlie had the same problem as the favorite in the 1998 Derby, and his offspring have turned out to be more successful at shorter distances than this. Besides the potential distance issues, there is reason to worry that even if he regains full health, that he has lost a lot of conditioning with his two race campaign this year and therefore hasn’t made much progress from 2 years old to 3. Add to that rampant speculation that he will still be scratched because he is still not 100% and that his body physically is not blossoming like some of these other colts, not to mention his extremely challenging post position, and you get the feeling of a horse that is draped in uncertainty. Conclusion: I for one hate stomach aches, so if he had a full blown infection and still competed well enough in the Wood Memorial to lose by a mere length, then I’m willing to view that as a positive effort. I have to assume that Todd Pletcher will scratch him if he isn’t at full health or fitness, so I am going to take a leap of faith and assume his somewhat average workout over the slop this week was simply a maintenance work. On talent alone, plus his clear affinity for this particular track, it would be foolish to leave him out of exotic wagers completely. If the speed holds, he will be force to be reckoned with, and at odds that are likely to be more than double what they would have been a month ago, so outright wagers appear to offer value as well, although the overall vibes are not that this is a horse on the top of his game. Tough call. Pros: He has been training spectacularly, gaining a strong bottom by putting in a couple of 7f works over the wet track as well as a sharp final 5f tuneup over a dry track in 1:00 and 2/5. He had excuses in his narrow loss last time out in the Louisiana Derby, as he lost a shoe out of the gate and still ran the race gamely to finish third by a length at the wire, only to be flattered by runner-up Nehro’s performance next time out in the Arkansas Derby. His eight career starts, many of them against large fields, give him an experience advantage over some of these, and this young foal is potentially sitting on a big race as he gains maturity and strength. He’s a tall, long colt who is more of a grinder in style, and should hang around long enough, and benefits from a central post that should allow him to fall in behind the pace without much traffic trouble. Cons: Somewhat shockingly, his Tomlinson Distance figure of 188 is the lowest in this field, and by a large margin. Therefore, there is reason to doubt his ability to get the distance based on his pedigree. He also hasn’t raced for six weeks. He was beaten pretty handily by Dialed In after a rough trip in the Holy Bull and didn’t show much punch in the stretch, finishing fourth in that race. 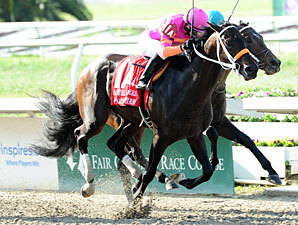 He did, however, bounce back and improve upon that effort to win the Risen Star. Conclusion: I generally am not a fan of grinders in this race, but in this case I am going to make an exception. I really like his toughness as well as his training regimen, and think his size gives him an advantage to maneuver through this large field and hold his momentum through the stretch drive. I’ll use him through my exacta and beneath in my trifecta. Pros: His ninth place finish in the Blue Grass is a throw out as this is a dirt colt that probably simply didn’t take to the synthetic surface in that race. He also had a terrible trip, and it was a strange path indeed for his connections to take towards this race, but I digress. 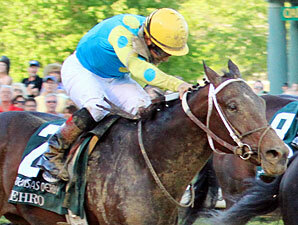 He has won over this track before, taking the 8.5f Kentucky Jockey Cup last fall. This year, he looked decent enough running near the lead in a second place finish in the Risen Star, losing to Mucho Macho Man. His Tomlinson Distance figure of 336 is the third highest in the field while his Dosage Index of 1.67 is the third lowest, so there is some evidence that he should enjoy the added distance based on his pedigree. Cons: He hasn’t really shown much since his win over this surface last year, and one has to worry that the trip he got in the Blue Grass didn’t allow for him to run his race and as a result, he didn’t get the necessary fitness out of that race. His campaign has been light in his three year old season with only two starts to this point, and this race is likely a tall task considering the quality of horses he has faced up to this point. Conclusion: He is still somewhat of a mystery horse. The talent is undeniably there and there isn’t much negative to say about him, but I just feel like he isn’t quite ready for this one. Nothing that he has accomplished in his three year old season places him among the best here, so I will look elsewhere. Pros: The surprise winner of the Tampa Bay Derby takes big step up in class here, and he won that race impressively after settling off the pace. His pedigree doesn’t suggest he should have any trouble with the extra distance. He is one of only three colts in this race to have Mr. Prospector in his immediate sire line, which has to count for something (great-grandsire). Physically, he seems to be flourishing. Cons: The Tampa Bay Derby form didn’t hold up well, and the 84 Beyer he posted in that race is the lowest top figure of any starter in the race. He came up empty last time out, finishing badly off the board in an incredibly weak running of the Illinois Derby. Starting from the farthest outside post doesn’t help his already dismal chances. Conclusion: It is too easy to view the Tampa Bay Derby as mediocre and forgettable, especially considering the figure, and the Illinois Derby was bad beyond words. This is a pretty easy toss. Pros: This colt has experience, having run six career route races. He stuck around in the Blue Grass Stakes to finish second last time out after running near the lead while the rest of the pace completely disintegrated. His Dosage Index of 1.15 is the second lowest in the field and suggests he should be able to carry his speed a long way. Cons: This will be only his second race on dirt, and in his only prior attempt he was a badly beaten eighth, so it is possible that he is a polytrack specialist. He also hasn’t faced tough competition in his route races, and as good as his Dosage Index appears to be, his Tomlinson Distance figure is equally disconcerting, checking in at only 248, the third lowest in the field, creating a bit of a head-scratching situation regarding the distance here. Conclusion: His name certainly has the ring of a Kentucky Derby winner, but sadly, his performances as of yet leave something to be desired. He certainly has the experience to be a factor around two turns, but I struggle most with his inexperience over the dirt surface. I won’t be using him. Pros: His closing moves in his last two races, runner-up efforts in both the Louisiana Derby and Arkansas Derby, were arguably the most visually impressive of any horse in the field, and it certainly seems like he is begging to go longer. In both of those races, he finished the final eighth in under :12.5 seconds and ran the final three eighths in :37 and change, numbers that are extremely competitive here (the :12.2 from the Arkansas Derby is the fastest of any dirt prep in the field). The 98 Beyer he earned in his last race is tied for the highest last-out figure here, and he’s shown improvement and toughness over his last two performances. He’s demonstrated some versatility as well, making big runs from far back and while running closer to the pace. He’s inbred to Mr. Prospector from the dam side of his sire line and sire side of his dam line, so it doesn’t get much better than that for a 10f horse. Cons: While a quick glance at his pedigree and races to date suggest he should relish 10f, his dosage Index of 4.33 is the highest in the field, suggesting he is bred for speed over stamina, although I have to admit, that number doesn’t make any sense. He also will be racing for the third time in six weeks on the third different track after breaking his maiden earlier this year, so one wonders if he is destined to bounce due to fatigue. Also, while his last two races have been impressive, he still has yet to win a graded stakes. Although he figures to fall behind the pace anyway, it merits mention that no horse has ever won this race starting from his far outside #19 post. Conclusion: It seems pretty clear that he would have won both of his last two races with even the slightest amount of extra distance, so I’m willing to overlook the fact that he’ll be going for his first career stakes win in the toughest of all stakes races, especially in a year like this one, where it appears that some sort of trend is going to be bucked. He has the type of turn of foot that I always look for in my Derby pick, and despite what the pedigree statistics say, I’ve seen his ability to cover a distance of ground with my own eyes, and his gallop outs have been most impressive. The only factor giving me any pause would be his short layoff after two tough races, but I am going to assume he will be fit and ready, as his works haven’t been grueling. The pick. Pros: He held on to beat a charging Nehro to win a tough edition of the Arkansas Derby after stalking the pace and making an impressive move around the final turn. He again should be close enough to the lead to benefit from a likely pace breakdown. He has posted three consecutive ascending Beyers, running an 89 in winning the 8f Southwest and improving to a 92 when finishing third with excuses in the Rebel before posting an impressive 98 in his Arkansas Derby win, and also posted the most impressive Thoro-Graph number in the field in that race. He has strong stamina influences on both sides of his pedigree, so the added distance shouldn’t be a problem. He has been working well over the Churchill Downs surface, breezing 5f in :59.2 and putting in a strong 4f gallop as well. Cons: The wire came just in time in the Arkansas Derby, as Nehro was eating up more ground late had his number with an extra stride. He ran the final eighth of that race in :12.8, which while competitive here isn’t as fast as some of his rivals. While he had excuses in easily beaten third place finish in his previous race, the Rebel (Alternation flipped in the gate next to him and caused some physical damage), he still wasn’t able to advance toward the winner down the stretch. He needs a fast pace to make his late run, and he’ll likely get that here, but if not, he could have trouble making up ground. He couldn’t have hand picked a worse post, as starting from the extreme inside he’ll likely get shoveled in behind horses in the early going. Conclusion: After re-watching the Arkansas Derby, I find it difficult to like him as much as I like Nehro since was barely able to hold off that rival and lost a great deal of ground to him through the stretch. However, he did demonstrate an impressive turn of foot in that race around the turn, and with the right trip and a bit of improvement, he should be squarely in the mix, especially with the way he has been working. Still, I have to remind myself that Lookin At Lucky was head and shoulders above the rest of last year’s field and even he could only manage a sixth place finish coming out of this post. I’ll use him on top in exactas and beneath in trifectas just in case, but outright wagers don’t look as promising as they once did. Bet to place at best, and require double digits to win. Pros: Regally bred, his connections are bringing him across the pond, so they must believe he has a real chance in this wide open race. He raced impressively at Dubai in the UAE Derby in his lone start this year to finish second at 9.5f over the turf, which is further than any other horse here has run up to this point. His Dosage Index of 1.07 is the lowest in the field, suggesting extreme balance between speed and stamina, while his Tomlinson Distance figure of 342 is the second best in the field. From a pedigree standpoint, he looks to be the class of this race- he’s also the only one with Mr. Prospector as his grand sire, and in any other year this would be an elimination factor. Cons: He has been very lightly raced, and despite a seeming affinity for distance, he may be better suited for turf. Not much is known about him aside from his strong pedigree, and he presents perhaps the biggest mystery in the field. The grueling trip from Europe certainly is not a positive, and no Euro runner has ever won this race. He certainly has the talent to make an impact here, but his lack of seasoning poses a big question mark. The word from the track is that he doesn’t look spectacular out there as of yet. Conclusion: It seems to me that this is the type of horse who will either steal this race or be left far up the track, and not likely in between. I generally use the track surface angle against Euro shippers in this race, as he’ll have a lot to overcome to attain the sort of comfort over the dirt to actually win this race after only one prep race and not having arrived at the track until Tuesday. His pedigree, while impressive from a distance perspective, seems to scream turf influence. I was planning to leave him out of my exotics, but in a race this wide open he may merit inclusion for the perspective of value due to his pedigree. Otherwise, I may put a small win saver on him if his odds jump above 30-1. Pros: While his races to date have not shown the speed that has been expected of him, his strong pedigree suggests he should only improve with distance. His nightmare performance while switching to blinkers in the Florida Derby came on an extremely hot day where none of the horses competed to the highest of their potential, so if you are throwing that race out for a horse like Soldat, then he deserves a look as well. He finished a decent fifth over this track last fall in the Breeders’ Cup Juvenile, and his dominating win in the Gotham over Toby’s Corner was flattered by that one’s upset win over Uncle Mo in the Wood Memorial. His recent works seem to be indicative of an improving horse. Blinkers come off for this race. Cons: While the distance shouldn’t be an issue, the main worry here is that he simply isn’t fast enough to compete with the better horses in the field. He seems to have had excuses in his losses, but even his win in the Gotham wasn’t impressive at all from a speed perspective regardless of how his beaten competitors have performed since. The fact is that he still has yet to demonstrate competitive speed at any time, so he may need the race to completely fall apart to grab a piece late if he is able to keep coming. That’s a lot to overcome as far as traffic is concerned. Conclusion: It is hard to find a handicapping angle that makes me want to use him based on his performances to date. However, this is the type of horse that has the talent to suddenly improve unexpectedly. It will surely happen at some point, and with the lower quality of this year’s field, why not Saturday? At 40-1 or higher, it might be worth a small shot, but there are others I like better for exotic wagers. 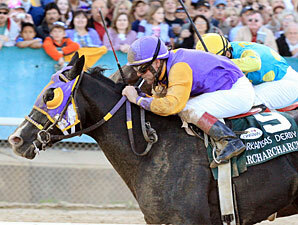 Pros: Calvin Borel, who has won three of the last four Kentucky Derbys, gets the mount. That alone merits consideration for a horse that otherwise appears to a notch below the rest of these. He has won three of his last four races including his last start in the Sunland Derby. His numbers are a notch below the favorites here, but he seems to be improving at the right time. He has ten races in his career so he is as experienced as any of these. If the track comes up wet, he is another that should benefit, as his Tomlinson Wet Figure of 424 tops the field. With his inside post and all the speed to his outside, Borel will have no trouble finding his comfort spot on the rail. Cons: While he has the tactical speed to enjoy a good stalking trip with a jockey who knows the track well, but he may just not have enough speed. His pedigree doesn’t pop off the page as far as him wanting the distance, and his races to date have come against suspect company. While an experienced runner, he takes a big step up in class here. His closing eighth in his Sunland victory was :13.5, so he will need to vastly improve on that to compete down the stretch here. Conclusion: From a value perspective, he figures to go off at lower odds than he should considering that Borel is on board. In fact, if he wasn’t riding this horse, it would be an easy toss. I promised myself I wouldn’t leave Borel off my tickets ever again after getting burned last year, but there isn’t much besides him riding that makes me want to bet this horse. Besides, the Bo-Rail strategy for this race is well known by now, so one has to figure he will have a bit of a target on his back. I’ll look to others for my bets. Pros: The likely favorite in this year’s race, Dialed In comes off an impressive off-the-pace win in the Florida Derby, so just like all of the closers, he should benefit from a hot pace up front which we usually see in this race. His Holy Bull win earlier in the year at 8f was commanding and he galloped out well, beating Mucho Macho Man fairly handily. He broke his maiden over this track as well. Trainer Nick Zito has had success in the Triple Crown over the years and seems to have a hot hand right now, and he has stated that this horse may be the best three-year old he’s ever trained. Coming out of the #8 post couldn’t be more perfect for his running style. Cons: With only four career starts, he is very lightly raced, and hasn’t worked very many times since his Florida Derby, so his relative fitness is a question. Although he won that race, he posted a slow final eighth of :13.0, a slower final three eights in :38.3 and his final time of 1:50 was a full second slower than the fillies that day, reflected by his somewhat low Beyer of 93. He actually lost a race in between the Holy Bull and Florida Derby in allowance company without many excuses, rallying to just miss the win. Somewhat surprisingly, his dosage Index of 3.62 is the second highest in the field, and he has some history to overcome from a pedigree standpoint as Storm Cat has never had a bloodline win the Kentucky Derby. Conclusion: For a likely favorite, there sure seem to be a lot of question remarks about his ability to win this race, and if ever there was a year to try to beat the favorite, this is it. It’s not that I dislike him, I just don’t think he has much of an edge against horses that will go off at five times his price, so why not play those? He’ll need a lot to go his way in order for his closing move to be effective, and his tendency to lug down the stretch gives me pause. More than anything, he just doesn’t seem fast enough or seasoned enough and I am not quite sure what I am missing as far as how much love he is getting. There’s also tat Storm Cat jinx. I’ll keep him in the mix on the bottom of my trifecta, but will try to beat him in the first two spots. Pros: His win from off the pace in the Santa Anita Derby was impressive, as his time of 1:48.2 is tops for the 9f distance, and his Beyer figure is very competitive in this year’s race. He clipped off the final eighth in :12.3 and his final three eighths in :36.7. While his sire was a champion turf miler and his offspring have shown an affinity for shorter distances, his dam was a winner in New Zealand at much longer distances than this race will be, and his damsire was a Grade I winner in France route races as well, so there is balance from a pedigree standpoint. Cons: Having not raced as a two year old, he’ll have to beat the dreaded Apollo curse, as no horse since that one in 1882 has won this race without a race as a two year old. Therefore, seasoning questions abound. While his Santa Anita Derby win was impressive visually, he benefited from the defections of Premier Pegasus and Jaycito due to injury, and as a result beat a fairly weak field. He also likely benefited from a slower pace up front (:47.1 for the first half) than he will see here, and was able to stay closer to the pace and conserve his energy for the finish. His recent works at Churchill have been a bit concerning, as he left the track tired and out of breath following a 6f breeze. Conclusion: The more I look at his Santa Anita Derby win, the less I like it. He was never further than two lengths behind the whole way, and with the fractions he will see here, he’ll be toast if he runs that close to the pace. While he is admittedly improving with each race, he has a lot to overcome having just broken his maiden three starts back and isn’t as seasoned as most of the field. I’ll look for value elsewhere. Pros: He showed a stunning turn of foot in winning the Blue Grass Stakes in his last start over the polytrack surface, closing into a slow pace after falling well behind it and coming home in :11.7 seconds for the final eighth and an astonishing :34.7 for the final three eighths. From a pedigree standpoint, he appears to be in good shape as far as distance races are concerned. From his workouts this week, he seems to be prospering and handling the track well. Cons: As strong as he looked in his last race over a synthetic surface, his form over dirt has been very poor up to this point in his career, being blown out in both of his dirt starts by double digit lengths, albeit at shorter distances. As good as his distance pedigree appears on paper, most of it reeks of turf influence. Conclusion: Truthfully, if he can take to the surface, he has a great chance to be flying late. However, his dirt races have been so poor up to this point that it is difficult to give him much support for the win. And if history is any guide, past winners of the Blue Grass since it switched surfaces like Momba, Dominican and Stately Victor made similar winning moves over the polytrack and were non-factors in the Derby after gaining similar hype based on their closing fractions. He’s probably a good candidate to fill out the bottoms of superfecta wagers, but any more would be putting a lot of faith in him at this point based on one race. Pros: His Tomlinson Distance figure of 365 is the best in the field, and he is clearly bred to run all day. Digging a bit deeper into his mostly turf-oriented pedigree, we see that his grandsire Candy Stripes sired Invasor, who won the 2005 Breeders’ Cup Classic, Dubai World Cup and Horse of the Year Award, and he was broodmare sire to Candy Ride, who still holds to Santa Anita Dirt record for the 10f distance. His win last time out came from just off a pretty taxing pace and he closed with authority, so he is definitely one to watch for picking off horses down the stretch. He seems to be working well over the dirt track, putting in 6f in 1:13 last week, and could be one to look for especially if the track comes up wet. Cons: His pedigree is one of the field’s most impressive from a distance perspective, but it is still dominated by turf influences as mentioned above. He has never finished worse than second in four career starts, but has also never raced on dirt. As impressive as his win in the Vinery Spiral was visually last time out, he ran closer to a pretty hot pace and despite passing three horses down the stretch, didn’t post competitive closing fractions into that pace (:13.8 final eighth, :39.8 final three eighths). That race was run on the polytrack, so he may have to move up on dirt to hit the board. Conclusion: Originally, I dismissed him completely based on his weak closing fractions in the Spiral, but a closer look at his pedigree and his impressive work over the wet track moved him up a bit on my list. I find him a bit more intriguing than Brilliant Speed simply because he has yet to run on dirt, so there is still potential that he could handle it well, and in theory, the pedigree is there. If he does, he may be able to grind out a good trip and find his way onto the board. He’s a live value horse that could really spice up the exotic payoffs. Pros: This late entry comes off a win two weeks ago over the polytrack in the Lexington Stakes, and was a last second entry after the defection of Toby’s Corner. He’s posted three consecutive increasing Beyer figures, and made a closing move to win the Lexington after falling about six lengths off the pace. Cons: The layoff is extremely short, and he will be taking a big step up in class here. It’s never in the best interest of the animal to throw a horse into a race that he hasn’t been prepared for simply because he suddenly has the earnings. His Tomlison Distance figure is the second lowest in the field, and the stamina influences that he does have are mostly geared towards turf. Conclusion: He appears to be in way over his head, and is my first easy toss. Of course, I said the same thing about Mine That Bird, so you never know. The addition of the $.50 trifecta to this year’s bets creates an affordable option for bettors to spread their bet more widely and hope to cash in (half) of a big ticket. It certainly beats the $1 minimum for the superfecta wager, which will be quite expensive and nearly impossible to hit this year anyway. Also, given the relatively high odds on a lot of horses with a fair chance to hit the board, combined with the likelihood of the favorites failing to hit the board as well, I expect larger payoffs in the place and show pools. This is another way bettors can attempt to capture value without having to figure out such an impossible race exactly to a tee. As an aside, I’ve included Uncle Mo against my better judgment, but considering that there is at least a 50% chance he withdraws tomorrow morning, assume my picks move up a line in that instance, including Master of Hounds ahead of Dialed In in my exacta, as I will still attempt to beat the favorite in the top two spots. Animal Kingdom moves into the last spot in my trifecta key in that event. Anyway, here’s how I’ll be spending my $100 Unit. Bet as many units as you want, and good luck! This entry was posted on May 6, 2011 at 4:00 am and is filed under Sports. You can subscribe via RSS 2.0 feed to this post's comments. You can skip to the end and leave a response. Pinging is currently not allowed.